A MAN from Bulawayo allegedly forged the signature of a resident magistrate in Lupane on a court order to recover his vehicle that had been impounded by the police. Tendaishe Victor Sibanda (25) allegedly faked magistrate Nondumo Masuku’s signature two weeks ago and misrepresented to the police that it was genuine. He is facing fraud and forgery charges. Sibanda pleaded not guilty to both charges before Bulawayo magistrate Mr Franklin Mkhwananzi. 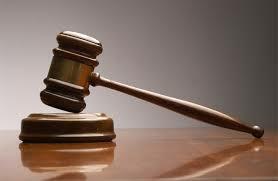 The magistrate granted him $100 bail and remanded the matter to Tuesday for provision of a trial date. Mr Mkhwananzi asked where he got the fake court order and Sibanda said it had come from the Lupane Magistrates’ Court. Prosecuting, Mr Maclean Ndlovu alleged that on April 5 this year, Sibanda took the fake court order to Bulawayo Central Police Station. “He approached Constable Zingwe who is the exhibit officer and produced the fake court order with the Lupane resident magistrates’ stamp. The court order, which had the magistrate’s fake details and signature, was compelling the Officer-in-Charge to release a Toyota Delphia which was an exhibit for a Lupane case,” Mr Ndlovu said. Mr Ndlovu said Cst Zingwe checked the two court orders only to discover that Sibanda’s court order was forged.